This one requires a bit of explanation. When I came across the excellent blog Renga in Blue, I learned that I had missed a whole load of adventure games when compiling my list. Not only do I now have another ten games to complete before I'm done with 1978, I also have a few from earlier years that I haven't played. I'm going to have to backtrack, and the first game that I'm playing is Wander, from 1974. Wander is a text adventure. More accurately, it's a system for designing text adventures, and it predates Colossal Cave Adventure. 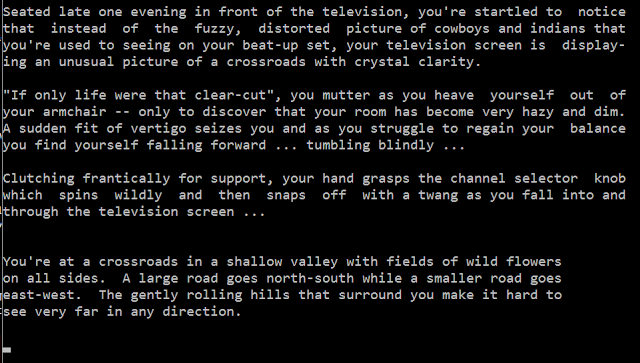 Colossal Cave is often touted as the first ever text adventure, but that's not accurate. It's a more influential game in the grand scheme of things, but it's not the first. Wander was designed by Peter Langston, a teacher at Evergreen State College in Washington DC. He had already designed the strategy game Empire before beginning work on Wander, and later in life he was instrumental in helping to start up Lucasfilm Games (which later morphed into Lucasarts). Wander is probably nothing more than a footnote in his career, and for decades it was considered to be lost. Apparently all it took to rediscover the game was an e-mail to Langston (I'm pretty sure there was more to it than this, but I'm hazy on the details), and once that was done several more versions turned up in quick succession. Wander was revised continuously into the the early 1980s, and I believe that I'm using a version from 1981. Anyone who wants to have a crack at it should follow this link. Several games were designed using Wander, and today I'll be tackling the first of those, Langston's own effort called Castle. 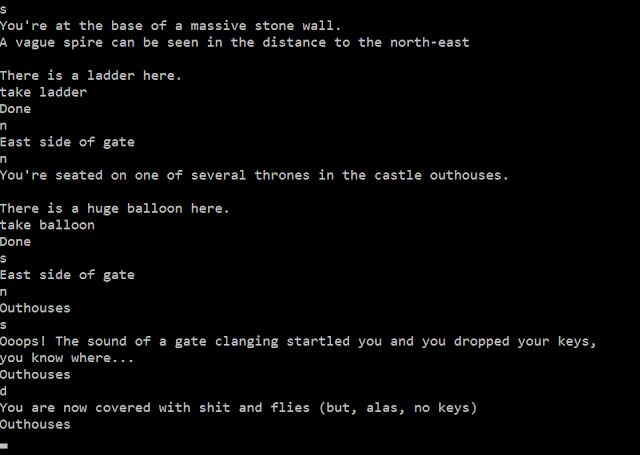 Langston wrote a few other games, and there's at least one by another author, but for the moment I'll concentrate on Castle, ostensibly the first text adventure ever made. From the outset, it's not clear what my goal is. The opening begins with my character being sucked into a television, and appearing at a crossroads in a forest. 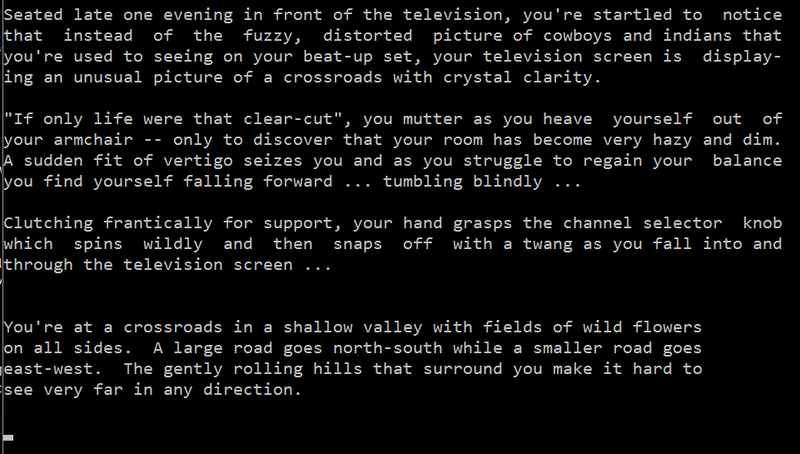 Without any purpose in mind, I spent my time exploring and mapping, which is my usual MO at the start of any text adventure. The first thing I noticed is that the quality of the writing is much higher here than in any of the other text adventures I've played. 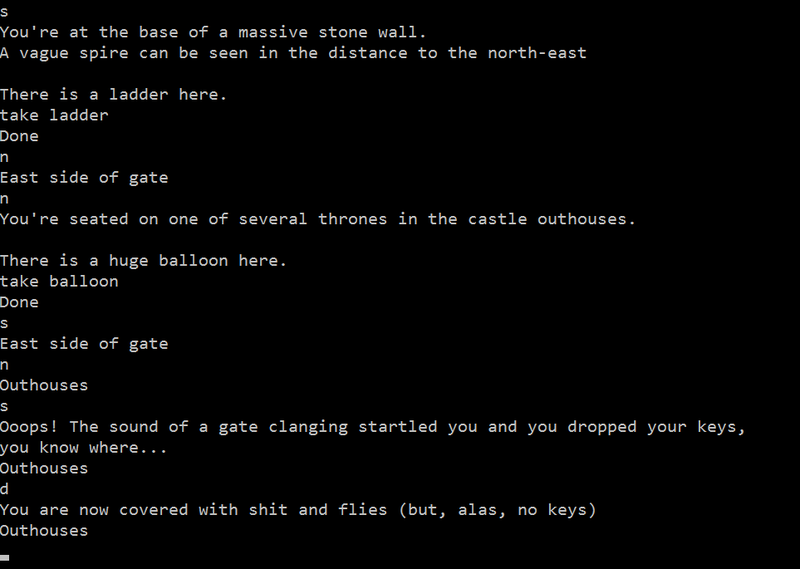 Colossal Cave Adventure was the previous holder of this crown, but Castle crushes it in this regard. I also tried typing SCORE, and got the following message: "Keeping score is an outdated, materialistic concept, don't you think?" I smiled, but I'm always slightly surprised to see games of this vintage being so self-aware of the genre conventions. 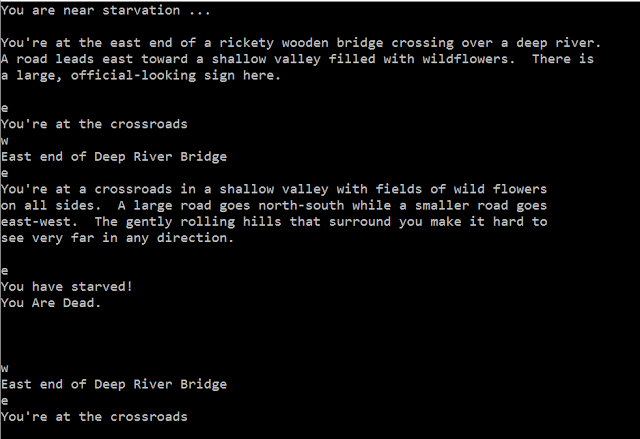 No doubt this was added to the game in a later revision, after Langston played Colossal Cave Adventure. I also encountered a reference to the magic word XYZZY, and an admonition that this was "an old, worn-out magic word". The opening area is quite small (a 3x3 grid), with obstacles blocking my progress on every side. To the west was a bridge that wasn't able to support my weight. To the north was a lake that was too wide for me to swim across. To the east was a wall, with a locked gate. And to the south was a forest that functioned much like a maze. Also of note was a river to the north-west, and a well to the south-east. In the river was a boat, but the current was too strong for me to use it. I was also unable to climb down the well, as there was no rope. I was stuck for a little bit, with no obvious way to progress. I also kept dying; the game has a starvation counter that runs down quite quickly. I've been able to postpone starvation with an apple that I found near the woods, and some strawberries found in the woods, but those don't last long. The woods themselves were also quite annoying until I figured them out. At first I thought they were a maze, similar to the ones in Colossal Cave. In reality most of the exits just loop back to one location, and the only way out is to keep going east or north-east. Starving to death is a temporary setback. Eventually I tried taking the boat, and this worked. I was stumped a bit here, because GET isn't recognised by this game, and that's the command I always use to pick up items. The command that this game uses is TAKE, which took me a while to figure out. But once I had the boat, everything fell into place. I dropped the boat in the lake, and was able to sail to an island with a honeymoon cottage. There I found a rope, which I was able to use to climb down the well. At the bottom of the well were some keys, and I was able to use those to unlock the gate. I was through the initial area, and into the castle's courtyard. The courtyard was another area of roughly 3x3. The castle proper is blocked off by a moat, which is full of piranhas, crocodiles and giant leeches. There's a passage leading south, but that's blocked by a portcullis. There are only two things of note in this area: a pear orchard, and an outhouse. The pear orchard is pretty simple. It contains a dead cow, and some pears that you can pick. It seems to me that the pears are poisonous, and sure enough the game doesn't allow you to eat them. I haven't found a use for them just yet. You can't take the dead cow. I thought about dumping it into the moat to distract the piranhas, but I don't think it's possible. Attempting to retrieve my keys, with surprising and hilarious results. Upon finding the balloon, I instantly had an idea. I took the balloon back to the bridge that couldn't support my weight, and sure enough it was filled with helium, and made me light enough to cross over. The area on the other side was small. The only thing I found there was a shovel, and a patch of forest that was really difficult to escape from. I starved to death while trying to find my way out, but through persistence (i.e. just going north over and over again) I was able to get back to the bridge. At the bottom of the well had been a sign that read "Can you dig it? ", which was an obvious clue. I went back there to dig with my shovel, and unearthed a glass tunnel. Further along I came to a hatch, which opened into a missile silo. Given the name of this game I'd expected that this was a fantasy setting, but the missile silo really threw me off there. To be honest, this makes things a little more interesting. 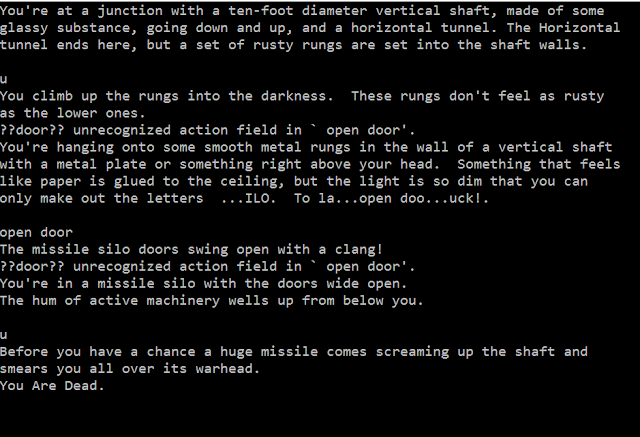 I wasn't able to explore further though, because a missile blew through the shaft and killed me. This time I was really dead, as the death message just kept repeating no matter what I did. That's where I left it. I'm not exactly stuck, but I don't have much of a clue what I'm supposed to do in that silo, or even if I'm supposed to be there. I'm actually pretty keen to get back to it. Not having an explicit goal intrigues me, as does the incongruous discovery of the missile silo. 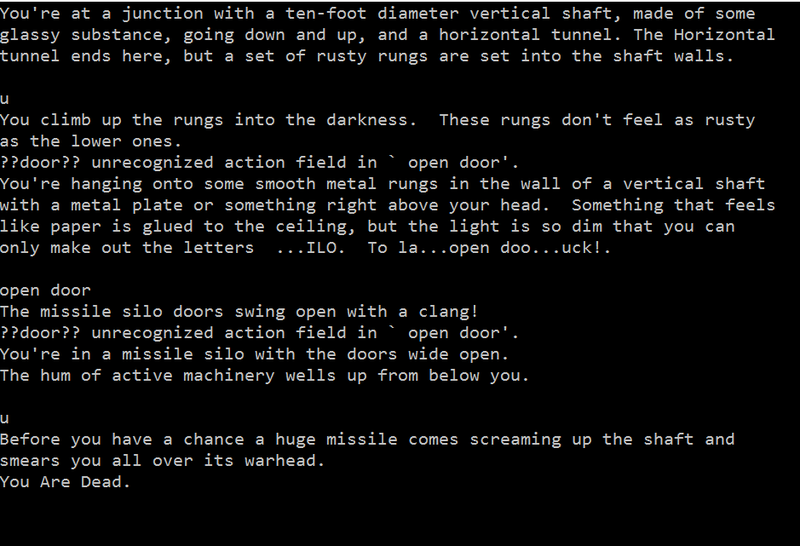 I'm probably building it up too much in my mind, but these unanswered questions make me feel like this game has a stronger story than any other text adventure I've played for the blog. It's not just another treasure hunt, and that's really refreshing. Hi Nathan. Considering that versions of The Oregon Trail were distributed in 1971 (7 years before the commercial release), shouldn't we consider TOT as the first txt adventure game instead of Castle ? I suppose you could, but I've never considered The Oregon Trail to be an adventure game as such. To me it feels more like a simulation/logistics game. If I was going to count it I'd have to look at things like Hamurabi as well. i can see the case for it, but the lack of puzzles and a proper text parser rules it out for me (and my list is large enough as is). I'm completely agree with your point of view. Thks for your reply. Castle [designed using Wander]: Victory!